As well as adding new collections (aka events), it is possible to edit current events. This can all be done directly in the Permutive dashboard. Firstly, select the event you'd like to edit by clicking on the title (eg. Pageview). As this is already an established event, the name cannot be altered. 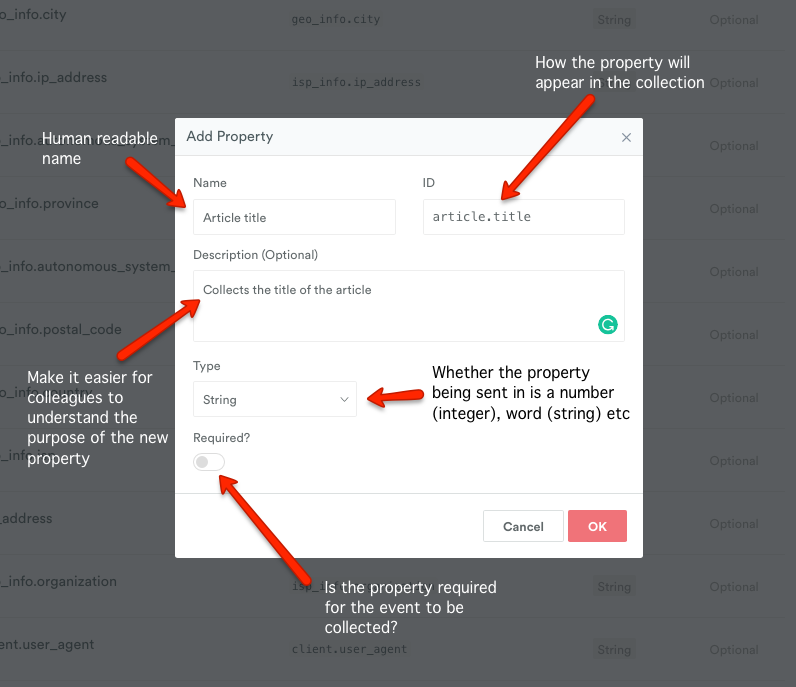 However, properties can be added and a description can be added. Type - eg. Integer, Float, String. The event will be rejected if the type of the property does not match the one set in the schema, so it is important you set the correct 'type'. Select OK → Save to save the new properties to the event. Once the schema has been edited, work with a developer to send in the new properties via the different sources described here. One saved, a user cannot delete properties.